My Samsung DLP has been acting flakey. Every so often when I turn it on, the picture doesn’t come up. It fixes itself when I manually unplug the set, then plug it back in after a few seconds. Does it need a new bulb? Is the color wheel sticking? 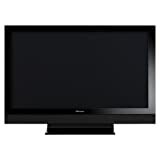 Pioneer, the maker of the best plasma HDTVs available today, announced that they are leaving the TV business. My local Magnolia A/V store is closing and offering great deals on everything, including Pioneer plasma TVs. My stock market portfolio has been destroyed by the economic meltdown. Well, ignoring item number four, it looked like time for a new TV! I picked up a Pioneer Kuro Elite PRO-111FD at my local Magnolia A/V, and am completely floored by the picture quality. I’ve never seen a better picture on any set, including the fabled Sony Qualia that I checked out in Tokyo a few years ago. Incredibly deep blacks, great color rendition, and a smooth film-like resolution. Absolutely amazing. I almost bought the Pioneer Kuro PDP-5020 instead. It’s cheaper than the Elite, with an identical screen, but missing the “Pro” picture tuning menu as well as an ambient light detector. It turns out that I use both features. The Pro menu lets me turn off several counter-productive picture “enhancement” settings. The light sensor lets me tune the TV for my normal nighttime theater settings, then auto-compensate during washed out daylight viewing. However, if I didn’t get a great deal on the Elite, I would certainly have opted for the 5020. If you’re lucky enough to be able to buy a TV during these nasty economic times, check out the Pioneer Kuros. And get one while you still can.